From Armenia to Australia, the U.S.A to the U.A.E, women across the globe are readying themselves for the biggest single day celebration of Women & Girls’ golf in the world on June 5th. Combining golf and socialising across a 4 hour experience, WGD events are designed to appeal to a broad spectrum of women and girls. From scratch players to absolute beginners, women are invited to come along and enjoy the experience of swinging a club under expert guidance and being part of an incredible community that has spread across the globe. 711 venues across 46 countries hosted WGD events in 2017 and that interest has fuelled this worldwide phenomenon that has now reached further than ever before with the introduction of events in Guadeloupe, Saudi Arabia, Turkey, Egypt, Russia and Hong Kong. With over 15 million social media impressions using #womensgolfday last year expectations are riding high for June 5th 2018 to be an incredible day for the women’s game. New venues have signed up all over the world for 2018 with 37 Topgolf locations across the U.S. being the latest to throw their support behind WGD. If a Topgolf isn’t in reach then there are golf courses and PGA Superstores all across the U.S. taking part too. Virtually every golf playing nation in the world is involved in WGD 2018, so if you want to perfect your putting in Puerto Rico, play with friends and family in France or encourage someone to take their first ever swing in Sweden, visit www.womensgolfday.com to find your nearest venue and take part in the biggest celebration of Women & Girls’ golf in the world. Partners and supporting organizations of WGD include: International Golf Federation, World Golf Foundation, LPGA, LET, European Tour Properties, TPC, NGCOA, EGCOA, ClubCorp, Billy Casper Golf, PGA TOUR Superstore, Ahead, Gallus, LPGA WWP, WIGI, Top Golf, Golf Now, All Square, Expert Golf, Troon and Troon International. 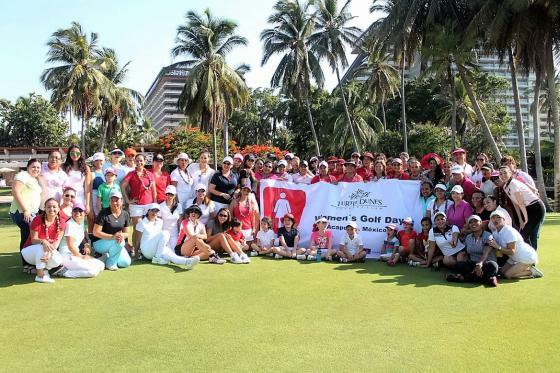 Women’s Golf Day (WGD) is a global golf initiative launched in 2016 to introduce women of all ages to the game and encourage existing female golfers to “tee it up” in a fun and highly inclusive environment. The one day, four-hour event, spanned 46 countries in 711 locations, and introduced thousands of new golfers to the sport while transcending language, culture, religion, and race to celebrate golf, women, and community. WGD created an incredible global community in two years and has the support of almost every major golfing governing body and organization. WGD’s primary hashtag #WomensGolfDay received more than 15 million global impressions to nearly 10 million users across Twitter and Instagram.